LARP stands for Live Action Role Playing. It is a game that consists of grown people dressing up in costumes and smacking one another with foam swords. I know, it sounds odd - like something your high school assistant principal gets busted for -- but trust me, it's actually quite cool. Players create their own character personnas, fashion some sort of a costume for them, equip themselves with LARP swords, and proceed to have adventures with other characters LARP events. These adventures often involve fighting non-player characters, which are people who help run the event. This is not to be confused with non-playa characters, which are characters who don't have a lot of luck with the ladies. Our full offering of foam and latex swords used for LARP, martial arts or just fun. 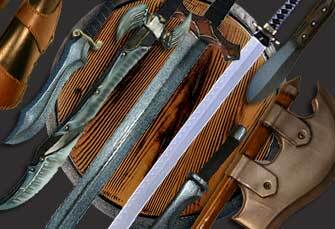 Medieval daggers, fantasy dagger, throwing knives and tantos. Boffer swords and shields are software are plainer than LARP, but still lots of fun. If those who "live by the sword die by the sword", you might want to use an axe, mace or spear. It's not all about swords, grab a fire axes or meat cleaver and join the rumble. Strongblade: Can you talk about some of your latest products? René: Epic Armoury releases new products every month. We have an ongoing product development and we see the whole range of products improving by every new release. The latest development is our dark metal finish [on armor]. We have developed a whole new technology for treating the metal armour pieces, and we have named it Epic Dark Metal. The surface is ruffled like it has been dug down for a hundred years, but the strength of the metal is unchanged. The colour is a matte warm grey, nuanced, beautiful Dark metal tone, and it gives the items a whole new look that just clicks. Strongblade: What makes your products different than others on the market? René: We aim to meet the requirements of our customers, and to make available to you what is not easily found else where. Therefore our assortment will show many different themes and styles within the product groups; foam weaponry, metal armour, leather items, camp gear and a selection of character accessories such as belt, bags, thieves tools and much more. The Epic product range offers both simple basic products for the young or newly started role-player, shopping for their first set of equipment. This is the Ready for Battle line. But we also design gear for the experienced player who really cares about quality, and rely on his equipment in combat. Our brand is based on loving the hobby, and we are proud to present a team of employees that works and develops for sharing the products with players around the world. That’s why we say that Epic Armoury is made by role-players for role-players. Strongblade: When the zombies finally rise from their grave and begin roaming the countryside searching for human brains to feast on, what is your plan of action? René: Every time we find our selves in this messy situation, we take them out 1 to 10. Strongblade: Is there anything else you would like to say about LARP of your company? René: Role-playing originally came from the US. It has developed in a lot of different ways over the past 25 years. We are a Danish based company, and our employees are a mix of role-players with a business background. We would love to see some our European aspect of the hobby which we love and cherish, being accepted in to the American LARP culture. [In Europe} we love the nice settings and most campaigns are trying to keep the players in game at all times. We see the costumes as a very important part of the setting, and the swords are almost never Duck tape weapons anymore. The different campaigns do not se each other only as a competing rivals, but also a way of trying different settings and games. We are playing in a campaign here in Denmark called Ezendo, but we always travel to other campaigns like Conquest and other games. It is just like going to different festivals and concerts together.